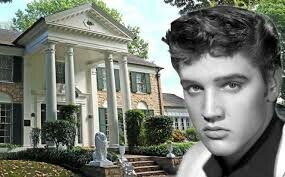 No, I am not thinking about Elvis Presley’s mansion in Memphis Tennessee, I am thinking of Graceland Park O’Donnell Heights Elementary Middle School, the newest school to the roster of other schools which is part of the JMM’s Museum /School Partnership program with Baltimore City Public Schools. Graceland Park O’Donnell Heights Elementary Middle School is in East Baltimore near the Interstate 95/895 exit for the Harbor Tunnel. The school is directly across the street from Temple Oheb Shalom Cemetery where Henrietta Szold’s parents, Rabbi Benjamin and Sophie Szold, are buried. Built in 1950, Graceland Park O’Donnell Heights Elementary/Middle school is slated to be torn down in the coming year to make room for a new school building that is currently under construction right next to the existing school building. 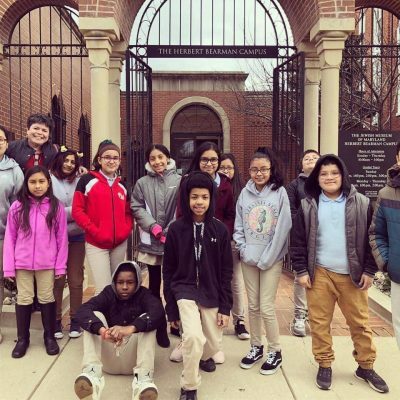 There are two existing elementary middle schools in the neighborhood, Graceland Park O’Donnell Heights Middle School and Holabird Elementary Middle School that are located within 3 blocks of one another. Both schools will be replaced with Baltimore City’s Public Schools first two “Zero-Energy” schools which will highlight future-focused and sustainable learning environments. Each of the schools has similar academic programs but they will be organized into flexible grade group clusters that will feature shared, collaborative learning spaces and environments to accommodate different student learning styles. Realizing the importance of giving both schools their own character, each school building will have a distinct exterior palette reflecting their school community. 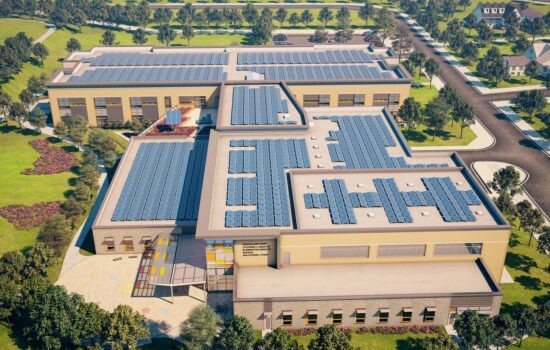 Each school will be equipped with student gardens, outdoor classrooms, rooftop solar labs, and vegetative roofs that further push innovation while intertwining sustainable concepts in education – staying true to their mission to nurture, engage, and empower the whole child for life-long excellence. 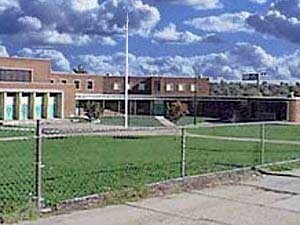 The JMM is excited to include Graceland Park O’Donnell Heights to our roster of partner schools this year. 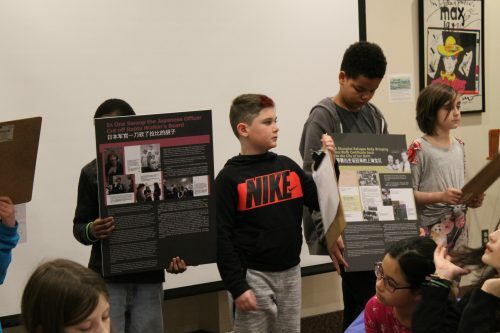 We are working with 7th grade teacher Amy Rosenkranz and her seventh graders in an education project, Graceland Park: PROJECTED where students will create their own stories of their communities and families. 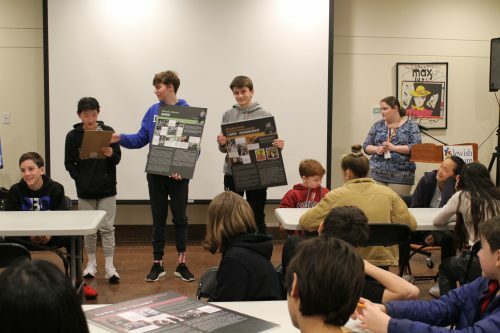 This project is very similar to the pilot project, Morrell Park: PROJECTED that we did last year with 8th grade students from Morrell Park Elementary Middle School. Once again, the project is led by young adult author, Jonathon Scott Fuqua and area graduate students who have been going to the classroom to meet with the students to discuss stories and the element of telling a story. The students have been listening and watching different kinds of stories, from interviews and short films to understand how stories are developed. The goal of the project is that the students will tell their own personal stories using video footage from their smart phones. The students will learn editing applications for the phone and will premiere their films later in spring 2019. Jonathon “Scott” Fuqua with 7th graders. 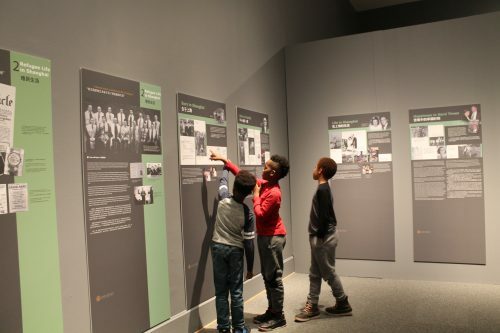 One of the components of the museum/school partnership is that the students get to visit the JMM. 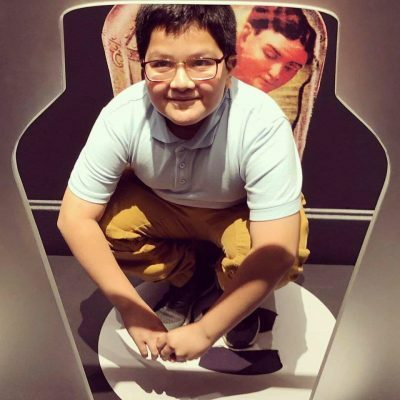 Last week, the 7th graders visited the JMM and had a fantastic time visiting the historic synagogues and discovering the fun inside the Harry Houdini exhibit. What does it feel like inside a milkcan? Graceland Park 7th graders visit the JMM! The administration at Graceland Park has been wonderful to work and one of the great benefits of establishing museum school partnership schools is that there is a shared learning between the students and teachers and the JMM’s education team throughout the year instead of the one-time museum field trip experience. What make this project even more exciting is that these 7th graders will take their newly acquired knowledge and skills with them as 8th graders next year. The school’s administration is hopeful that these students will become the stewards for Graceland Park O’Donnell Heights Elementary Middle School as they document, film and tell the story of the closing of the existing school building to the opening of the brand-new school facility. 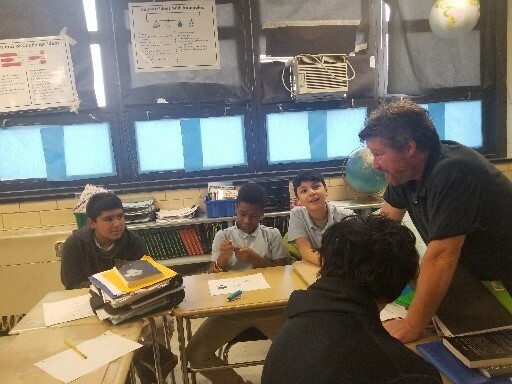 The JMM is looking forward to working with the budding filmmakers and storytellers of the Graceland Park O’Donnell Heights Elementary Middle School community! Learning at the Jewish Museum of Maryland takes many forms. 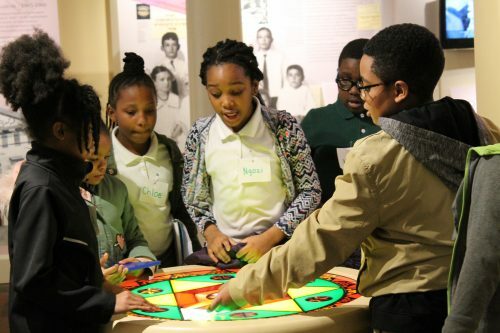 Since the beginning of the school year in September, over 1000 students, teachers, and chaperones have brought their curious minds to the Museum with the hopes of learning something new. In November, Northwood Elementary School’s seventy-one 4th grade students visited over two days. 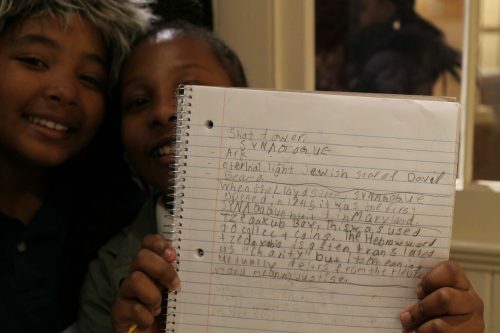 They participated in our Introduction to Judaism program that takes place in the Lloyd Street Synagogue. 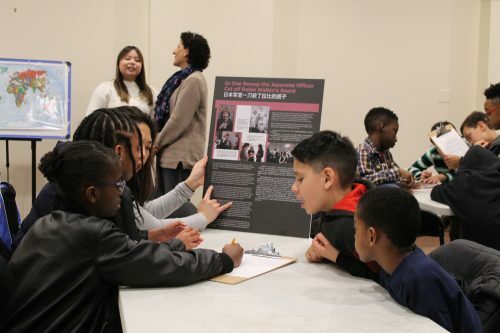 Northwood’s students were a perfect example of what learning in the Lloyd Street Synagogue looks like. However, my title is not completely accurate. It’s not just what learning “looks” like. It’s not just visual. It’s verbal. It’s auditory. It’s kinesthetic. At the JMM we encompass all these styles. Learning is visual. 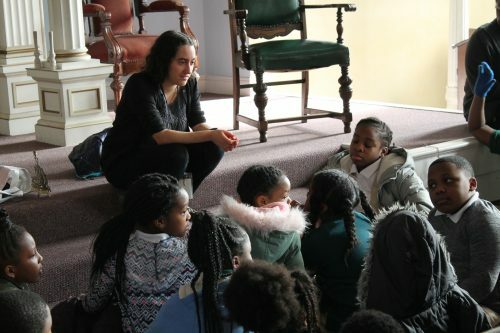 Inside the sanctuary of the Lloyd Street Synagogue, Program Assistant Emma asked Northwood students what they saw. She was curious to know what looked familiar to students and what was new. It was like a “show and tell” of the Synagogue. Students found the ark, bimah, Ner Tamid, and the Star of David stained glass window. Notably, students pointed out that the phrase written across the ark was not in English, but in Hebrew. Students playing Show and Tell in the Sanctuary with Emma. Learning is verbal. Its students sounding out letters of the Hebrew alphabet as Emma teaches them a new word. Students didn’t just find the Hebrew characters above the ark, they had an opportunity to learn Hebrew phonetically. Students using Hebrew guides to sound out the word Shalom. Learning is kinesthetic. Students didn’t just see the oldest architectural exterior stained glass window in the United States, they built it. This hands-on approach by our education team is often mentioned by teachers in their feedback forms as something that impressed them. Northwood’s 4th graders piecing together the Star of David stained glass window. A Student’s amazing notes made during her visit at the JMM. Finally, learning is social. 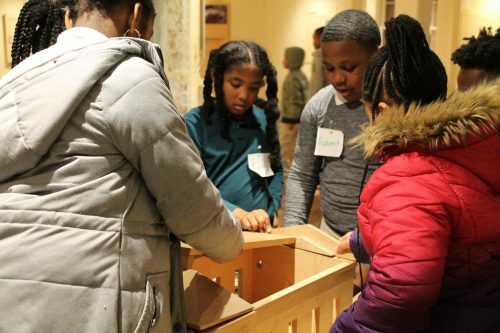 After spending the morning exploring the third oldest synagogue still standing in the United States, students worked together to recreate the building. They chatted amongst themselves to determine which wall went where and when the bell tower was added (and removed). Northwood Students working together to build the Lloyd Street Synagogue. 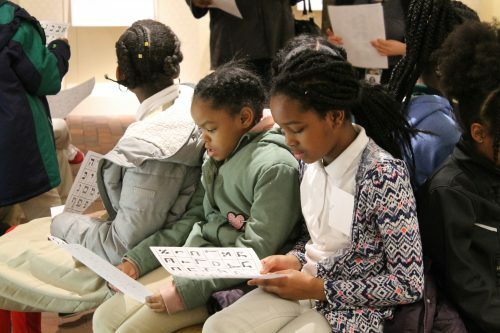 Each school visit to the Jewish Museum of Maryland is unique. Each student may connect with a different part of the story that we share. What is not unique is that every student walks away having learned something new that will, hopefully, spark a future conversation with friends and family. 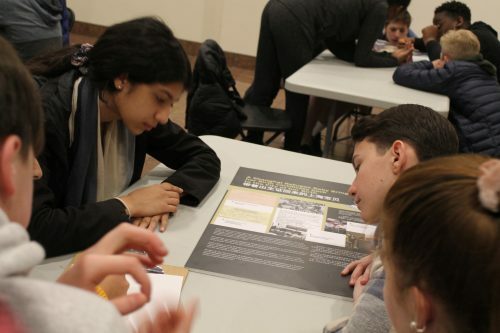 On a feedback form, a Northwood teacher remarked that “My students were virtual ‘blank slates’ when it came to Jewish history … it’s been a joy watching them learn so much!” I can guarantee that our education team enjoyed seeing, and being a part of, all the types of learning that took place with the Northwood Students.